There is an interview scheduled for you in next few days, so you need to be best prepared to face the worst. You can easily crack the interview process with understanding of some basic fundamentals related to the job, employer (the company) and employee (that is you). Here I will present a guide on, How to prepare for an job interview with the skills and techniques that you should possess to succeed and get the job easily. Cracking the interview is easier then it seems, you just need to understand what the company expects and you need to be fully prepared in required skills and techniques with regards to the company’s expectation. For easy understanding I will divide the required interview preparation skills and techniques in 8 easy steps. So here goes the 8 easy tips for interview preparation to crack the interview easily and you can get the job of your dreams. This is the first step towards understanding the expectation of the company from the person who will fill the opening job position. You need to carefully go through all the skill set mentioned in the job description and job responsibilities. It should not happen that the company expects you to have 7-8 different skills while you possess 2-3 skills. So understanding the skill set is the first important step. So after you get the understanding what skills you possess and what you don’t, so it becomes easy for you to start working on the skills that you don’t possess. Example-Job description say’s that you should be great with written e-mail skill. So once you identify that you don’t possess that skill, you can start working to learn the email writing skill. This step is really important step as this is the 1st thing any interviewer will see. Your resume is your reflection, so you need to be perfect in your resume. You need to make sure that your skills are properly highlighted in the resume with regards to the job interview’s required skills. Many times the interview can take a bad turn because of some small mistake in your resume, while at times some of your really great skills mentioned in your resume in a proper manner can also help you towards your goal of securing the job. So go through your resume 4-5 times properly to be sure that there is no mistake. 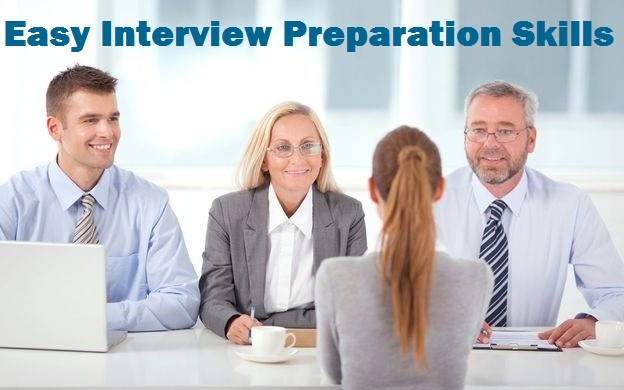 Most of the interview process starts with the basic aptitude exam. Aptitude exam consist of basic maths questions of percentage, profit-loss etc… Also aptitude can also consist of English grammar questions, correct sentence formations, etc. So make sure that you read some good book for perfecting your skills upto intermediate level English grammar and Maths. So you went through the job profile which seems impressive..!! But did you went through online to know more about the company you would be giving job interview in ? Knowing about the company is really important, as you will get to know where the company currently stands, what all future opportunities are possible for your career growth ahead inside the company and also know about the company’s leadership. Knowing the small aspects of the company might also give you an edge over other candidates, as you would know more about the company so you can understand the way company works and earns revenue. Also during interview, the interviewer can ask about the company’s profile ( products of company, its big clients or its revenue model) from you, so if you answer it, it will definitely give you better chances of getting selected for job. This is simple and easy, so make sure you are perfectly dressed, nor over dressed nor under dressed. For girls simple trouser and shirt is good and for boys pant/trouser with shirt is the right combo. a) Tell me something about yourself ? b) what are your salary expectations? c) can you work overtime if work permits? d) Tell me your strengths and weaknesses? e) why you want to work for us(Company) ? When you enter the interview room, make it a point that you will greet the interviewer with a warm good morning/ Good afternoon depending upon the time of the day. Also make sure that you carry a little natural smile while you greet. When the interview is over, greet the interviewer with a warm good bye greetings like “Have a nice day sir/ ma’am” or “Good day sis/ma’am”. Warm greeting at the end of the interview does not gives you the job, but definitely it adds a little positive impression towards your candidature. Also if interviewer extends its hand to greet you, make sure you firmly shake hands keeping in mind that your hands should be clean. A good Handshake also gives a positive impression of a person. Sometimes the interviewer will extend gratitude towards you by asking if you have some question for the company. This moment can sometimes be a make or break situation for you. So if you replied to interviewer that you don’t have questions, implies to the interviewer that you are not very much interested in the job, so other candidates will have an edge over you for getting selected if they had put forth good questions. Also, if you took the opportunity and asked a question, but you didn’t ask the right question so again it works negative for you. So it is best that you get prepared with 1-2 questions that you would want to know, it can be question regarding the career opportunities in the company, job profile or company work culture. If you bang with the right question it can be a positive point for you, thus giving you more chances of getting selected over other candidates. Be prepared with these 8 easy tips while preparing for an job interview and your chances of getting shortlisted will be definitely more. Lastly, this is not interview tip, but this tip will help you secure good job as a fresher in India. Liked the 8 Job interview preparation tips, skills and techniques..!! Then Like us on Facebook and share this article with friends who are preparing for job interviews, as it may help them to be better prepared. Subscribe to ‘Stunning Always’ to receive more new interesting Job and interview skills articles right into your email inbox. Share with us, if you know some good tips that helped you crack job interviews easily and comment down about what you think of these 8 easy interview preparation steps, also comment down for any of your queries for interview skills.